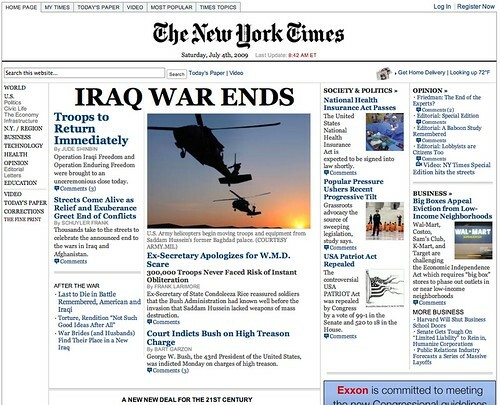 Big time congratulations to the team behind the fake New York Times from the future that hit the streets and the web today! The combination of great writing, design, and transmedia marketing is totally impressive. I’ve got a physical copy of the paper on my desk, courtesy of my co-worker Jay who brought in a stack for the office. I will be reading and enjoying this liberal fantasy all day. Close Gitmo! End the War! Repeal the Patriot Act! Woo hoo! This is the spoof to end all spoofs.